SPECTREOUTREACH.com: Your bath will never be the same thingy again! Your bath will never be the same thingy again! 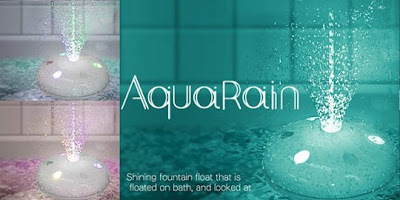 Aquarain LED bath fountain from Japan from JapanTrendShop on Vimeo. No. it not some magic or special effect but "Aquarain from Happinet enhances your bath time like nothing else, adding relaxing LED lighting with 4 colors that mix together to form 7 colors and create endless patterns to light up the dancing fountain." "Since Aquarain floats, just place it in your bathwater, turn it on, and let the water come up through the jets. You can use it without the fountain as well to create relaxing mood lighting. Rotate the fountain dial to change from a concentrated stream to a spray. " I and most of you reading can use this one now at home. very interesting and new :D & btw is US$58 expensive?